On 29th May 1786 John Pingo, the engraver to the Goldsmiths' Company of London, petitioned the Company for an increase in salary because of his greatly increased workload. Within this petition he mentions that: ".....I have also made double marks on single punches for Tea Spoons...." (note 1) and these 'Double Marks' are mentioned in the mark registers from 1785, the first year in which mark registers (or mark books) were kept. This double mark takes the form of a date letter in a Norman shield with canted top corners and a curved base followed by the sterling lion in an oval cartouche and makes its first appearance on the mark plate (a sheet of soft metal such as copper on which the punches used in a given year are struck) in 1782 although it had been used on tea spoons from 1st November the year before. It disappears from the plate in 1786 when the fly press mark for tea spoons was introduced. 'Duble (sic) marks' were again mentioned in the mark book entry for 1788 and were for use on rings. Observation of the mark plate shows that this time the mark took the form of the duty head followed by the lion. In 1789, according to the mark book, this punch was used on buttons, rings and knife hafts and in 1790 there are two references to it; one for rings and the other unqualified. Observation shows that this second punch was used on tea tongs (sugar tongs) and this is useful for dating tongs as this is the only year in which they were marked in this way since a fly press mark, for marking tongs, came into use in 1791. Note that the outline to the lion is now rectangular with canted top corners and an ogee base. Although the double mark punch introduced in 1788 was still being produced in 1792, at this stage it must have been for use on buttons only as in that year both rings and knife hafts were being marked by means of the press with a triple mark which was of this same format but with the addition of the date letter at the end of the sequence. By 1792 it had become obvious that double mark punches could be of great use in the marking of all sorts of other plate and in that year two other double mark punches were introduced; one with the lion followed by the leopard, which is in a Norman 'kite' shield with canted top corners, and the other with date letter followed by the duty mark. double mark punches used on curved surfaces. Not only were these marks used on some hollow ware, on the curved surfaces of which the press could not be used, but they proved most useful in the marking of plate for which the usual marks were not appropriate. 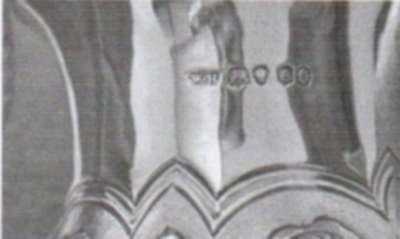 The image below shows the marks on a sterling standard teaspoon of the same date for comparison. Recognition of these double marks can be of considerable assistance to the collector in, for instance, determining the date of a piece. Photo below is of a milk jug by Andrew Fogelberg and has the date letter "O" for either 1789/90 or 1809/10. 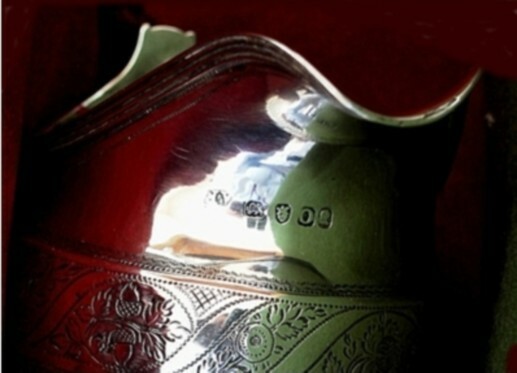 Close examination of the marks reveals that, whereas the lion and leopard marks have been individually punched, the date letter and the duty mark have been applied by means of a double mark punch so that the jug must have been assayed after 1792. Its assay date is, therefore, 1809/10. has been used to mark this piece. By the turn of the century the idea of the double mark punch was well established and in 1813 a unique and rather delicate little mark was introduced for marking pendants on which no duty was payable. This took the form of a double diamond or lozenge in the first half of which was the date letter and in the second the sterling lion. This mark appears not only to be unique in its design but is also smaller than any other mark that I have yet come across. I imagine that it is also somewhat uncommon. 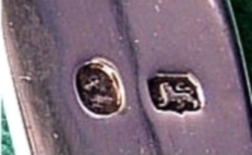 By 1818 a double mark punch comprising a lion within a rectangle with canted top corners and an ogee base followed by a date letter within a similar outline had also been introduced in two sizes but there is no indication on the mark plate that it was to be used in combination with another double mark punch and it may, therefore, have been intended for partial marking. NB: Hollow ware such as tea pots and caddies were marked underneath at this time and the marks were thus still hand punched in clock face fashion since such pieces could not be accommodated in a fly press. I am greatly indebted to the Worshipful Company of Goldsmiths for extending to me research facilities. 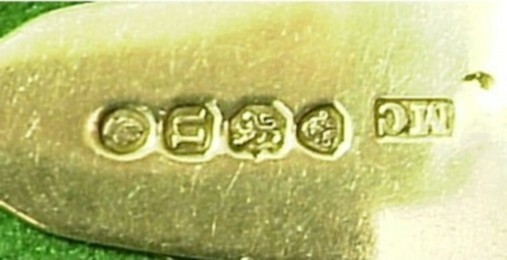 Some of the information in this article was first published under the title "The Introduction of Double Mark Punches" in "The Finial" (the journal of The Silver Spoon Club of Great Britain) in June/July 2003). note 1 - Goldsmiths� Company Assay Office Court & Committee book 2 p15.